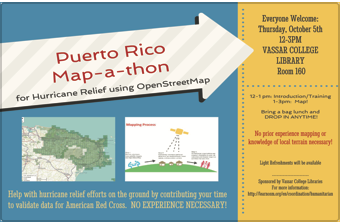 Contribute your time to open-source mapping to aid relief efforts in Puerto Rico. No​ ​mapping​ ​experience,​ ​knowledge​ ​of​ ​local​ ​geography,​ ​or​ ​software​ ​installation​ ​is required. Just bring yourself, lunch if you’d like, and a laptop (if you’d prefer to work on your own device rather than a classroom computer). We’ll have a training session from 12-1 p.m., but will be available until 3 p.m. — drop in at any time to get started. Learn more about the process through our guide, Humanitarian Mapping with OpenStreetMap. Download a copy of our flyer to distribute on campus. This entry was posted in digital humanities by Joanna. Bookmark the permalink.